Platinum is one of the costly metals used as catalysts in new technologies employed for industrial chemical processes, renewable energy sources, pollution control and many other purposes. In particular, it is used for fuel cells, devices that turn chemical energy directly into electrical energy, without combustion. Research has shown that the greatest efficiency is achieved when the catalyst is available in the form of nanoparticles (smaller than 10-9 m). Simply put, the greater the dispersion of the material and the smaller the size of the particles, the more is it available for catalysis. Unfortunately, the laws of thermodynamics cause the particles to "stick" to one another and form larger clusters, which is why the material becomes less effective over time. So what can be done to maintain maximal dispersion of the "nanopowder"? A group of SISSA/CNR IOM scientists (with the collaboration of the Univerzita Karlova in Prague) has studied a way to produce tiny platinum grains consisting of one atom only and to keep them dispersed in a stable manner, by exploiting the properties of the substrate on which they rest. "Theoretical work demonstrated that irregularities in the surface known as steps and observed in experiments conducted at the Trieste Synchrotron tend to attract and separate the nanoparticles, causing them to remain literally attached in the form of single atoms", explains Stefano Fabris, CNR-IOM/SISSA research fellow. "The particles adhering to the steps were no longer visible even using an atomic resolution microscope" explains Nguyen-Dung Tran, a SISSA PhD student. "However, their presence was detected by spectroscopy, so they were indeed there, but they were no longer visible or free to move around". 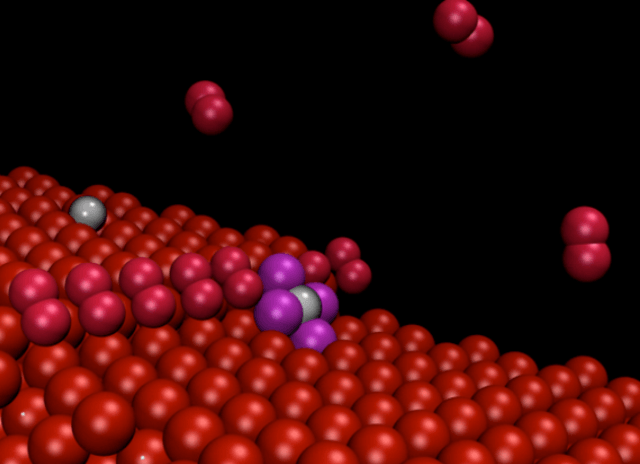 "Our computer simulations solved this dilemma, showing that the particles on the steps are reduced to single atoms" adds Matteo Farnesi Camellone (CNR-IOM), another author of the study. "If the surface is engineered to contain a large number of these defects, then the force that binds the particles to the substrate effectively offsets the aggregation force", explains Fabris. The theoretical work, led by Fabris, allowed the researchers to develop a "system model" on the computer able predict the behaviour of the material. The model's predictions were confirmed by the experimental measurements. Materials like this can be used for fuel cell electrodes, with far lower costs than the current ones. "Reducing the amount of platinum used in fuel cell electrodes is a priority, not only to contain costs but also to ensure environmental sustainability, as also indicated by the recent European directives" concludes Fabris. The European project ChipCAT, which funded this research, aims precisely to achieve this goal.